The circular, barren patches of land, forming a highly regular pattern over the dry grassland of Namibia, were thought to be the only ones of their kind anywhere in the world. But a new study in the journal PNAS shows that they are not. Working with Israeli and Australian colleagues, researchers from the Helmholtz Centre for Environmental Research (UFZ) in Leipzig have now discovered the baffling structures in the uninhabited Australian outback too. Investigations carried out there have also provided new evidence that these fairy circles result from the way plants organise themselves in response to water shortage. 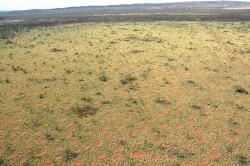 Aerial view on the Australian fairy circles which spread homogeneously over the landscape. A large fairy circle with a hardened top-soil layer that prevents the growth of grass. 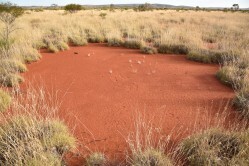 Australian fairy circles have mean diameters of 4 meters but some may exceed 7 meters. The researchers were alerted to the natural phenomenon in Australia by the photo taken by an Australian colleague, who sent them an aerial shot of the region surrounding the town of Newman. The photo showed plant patterns that were very similar to the fairy circles which had only ever been found in southern Africa. There are various theories in the world of science as to how these barren circles edged with grass come about. Some researchers have explained them away using termites or ants. The theory goes that these insects nibble away at the roots of the grasses, killing them. Other scientists believe that toxic carbon monoxide gas rises up from the interior of the Earth under the circles and kills the vegetation. And a third camp thinks that the barren areas simply arise of their own accord under certain conditions. The amount of water available at the transition between desert and grassland isn't enough for continuous vegetation cover. So the individual plants compete for the precious water and therefore organise themselves in this characteristic grass carpet with holes in it. Fairy circle expert Dr. Stephan Getzin from UFZ has for years supported the third theory. Aerial views of the landscapes have contributed to this conviction. In earlier studies, he analysed the precise location of the barren patches. "The interesting thing about fairy circles is that they are spread with great regularity and homogeneity, even over vast areas, but they occur only within a narrow rainfall belt" he explains. He believes that this pattern, which resembles the six-sided structure of honeycombs, most probably results from competition for water. He and his co-authors Hezi Yizhaq and Ehud Meron from Ben-Gurion University of Negev in Israel have also confirmed this appraisal with computer simulations. "For a long time, ecologists weren't convinced that plants in dry areas could organise themselves because the theoretical principles for these processes lie in physics," says Stephan Getzin and points to the laborious preparatory work undertaken by his two Israeli colleagues. "But it has since become increasingly clear how important this process is." Some colleagues remain sceptical despite this. One frequently heard objection is that if such a mechanism were responsible for them, there would have to be similar structures in other dry areas on Earth. After all, the grassland of Namibia is by no means the only place where plants compete for water. And in fact, it is known that drought causes interesting vegetation patterns in other places too. But barren patches in grassland with such a regular six-sided structure don't appear anywhere other than in Namibia. This explains why Stephan Getzin was so excited to receive the aerial shot from Australia in 2014. To investigate the phenomenon more closely, Getzin and his Israeli colleague Hezi Yizhaq went to Australia. The scientists measured the barren circles, compared their surface temperatures with those of vegetated areas and charted indications of ants and termites in four parts of the almost uninhabited region. They observed how the water drained away in these areas and took soil samples to analyse later on in the lab. To this, they added aerial image evaluations, statistical analyses of the landscape patterns and computer simulations. Since then they have become convinced that they are actually genuine fairy circles with the same patterns as those 10 000 kilometres away in Namibia. The researchers have also found new evidence supporting their theory of how the barren patches arise. While in Namibia there are usually two to three species of termite or ant scuttling around in or on the fairy circles and opening up scope for speculation, the situation in Australia is clearer. "There we found in the majority of cases no nests in the circles and unlike in Namibia, cryptic sand termites do not exist in Australia," reports Stephan Getzin. "And the ones we did find have a completely different distribution pattern to the fairy circles." For him this is a clear indication that the barren patches are not produced by animal activities but the way in which the plants organise themselves. This theory is also supported by the fact that the dominant grasses of the Triodia genus found in the direct vicinity of the fairy circles also form other typical drought patterns such as stripes, labyrinths or spot patterns with individual plants surrounded by bare earth. Especially stripe and labyrinth patterns form preferentially on hard soil layers with overland-water flow, as is commonly observed with lined up trees along mountain slopes. Following their investigations on the ground, the researchers have also gained insight into how the soil and vegetation interact in this region. If the Australian loamy soil isn't protected by vegetation, its surface doesn't just get extremely hot. It bakes to a hard crust that water finds almost impossible to penetrate. Water which does fall in the rare rain showers flows away over the surface, resulting in extremely bad conditions for germinating plants so that the bare areas remain barren. Things are different in places where the first grasses are growing. The plants keep the surface cooler and the soil looser so precipitation finds it easier to seep in. This allows other plants to colonise the area and the conditions again improve slightly - it's a small-scale, self-perpetuating process which results in the grass carpet with gap pattern we see covering large areas. "In Namibia, the sandy soils of the fairy circles are much more permeable and precipitation can drain away with ease," says Stephan Getzin. So reservoirs form under the barren areas, supplying the surrounding grass with moisture via diffusion processes in the soil. "The details of this mechanism are different to that in Australia," he explains. "But it produces the same vegetation pattern because both systems of gaps are triggered by the same instability." Stephan Getzin now wants to follow up the phenomenon even further. He believes that it is likely that there are as yet unknown fairy circles in other dry and sparsely inhabited regions of the world. The age of discovery is far from over.